There’s a time and a place for following the rulebook, but when it comes to street photography Olympus Visionary Chris Eyre-Walker suggests tossing out the tome. Street photography is about story and the way a subject interacts with the surroundings. Rather than trying to nail the right settings or striving for the best possible image quality, simply go for it. Some of the most intriguing street photos are blurry, grainy and even out of focus. It’s about sharing moments, emotions and perspectives. You want to give your viewer a sense of what the experience felt like. Did the moment make you cheery or miserable? Was it funny or curious or just incredibly boring? In a great street shot the audience can feel the photographer’s emotion, or that of the subject, because they are invited into a scene that might have lasted only a fraction of a second, yet tells a much deeper narrative. When it comes to snapping those experiences I might ditch the usual rules, but there are a few things I try to do to increase my chances of capturing them. Shot from the hip in Léon, Nicaragua. Long lenses might seem tempting at first – they allow you to feel less awkward by keeping you at a distance – but using one also means you are roaming the streets with a huge piece of equipment that you have to point directly at your subject. Noticing someone watching you from behind a giant lens can be intimidating and this paparazzi-style method is likely to make a subject feel uncomfortable. Instead, ditch the creep factor, get in close, smile and shoot with a wider lens. Your images will look and feel much more dynamic and your audience will have a sense of being placed right in the middle of the scene. Anything between 12 and 50mm is usually a great starting point, and my recommended lens for this is the Olympus M.Zuiko 12-40mm f/2.8 PRO, as it covers most of that focal range. Prime lenses (lenses without zoom) are a good way to go as they force you to move around to get the right composition, and you don’t get too complacent by standing in one spot and just framing the shot by zooming in or out. Another advantage of wide prime lenses is that they are usually very compact and less in your face, so you’re not as likely to stand out in the crowd. When you’re close to people be friendly and grin a lot. People tend to return a smile with a smile, so it’s not only healthy, but it also breaks the initial barrier of awkwardness and allows you to capture a more authentic image. Getting lost in a market is a great opportunity to practise street photography. I tend to leave my camera on if I think I might want to take a photo. There’s nothing worse than spotting a great scene, raising your camera for the shot and watching the opportunity pass through the viewfinder because your camera isn’t switched on. Candid moments are fleeting and you don’t want to waste time with last-minute adjustments. Usually a shutter speed of at least 1/200sec will freeze most of the movement in a street scene. Alternatively, sometimes a slow shutter speed (1/10sec) can be useful to capture movement as a blur around a stationary subject, adding atmosphere to the shot. You’ll need a very steady hand or great sensor/lens stabilisation for this to work effectively though, which the Olympus OM-D E-M1 offers with its five-axis stabilisation. It’s in the details: watching TV through a window. Street scenes can be incredibly busy. There’s traffic, constant movement and all sorts of activity going on around the base of buildings. 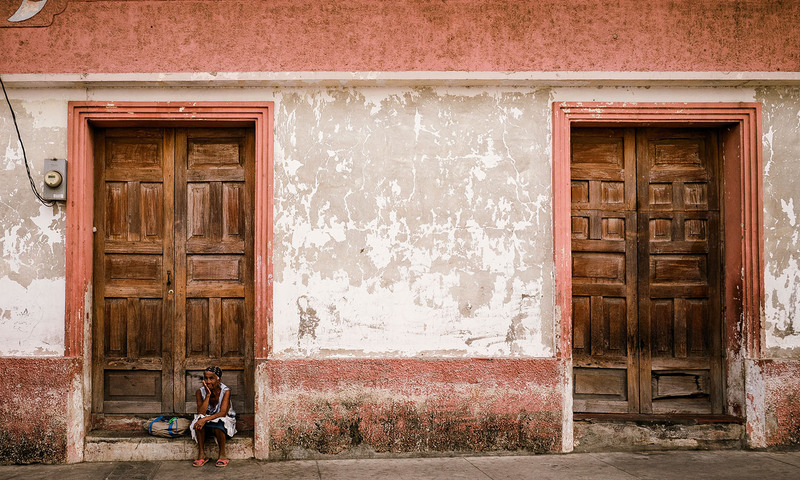 Instead of trying to photograph the whole scene, isolate specific details that tell a story. Find people who are doing something interesting; a stallholder cooking street food, old men chatting over a game of chess outside a cafe, someone walking alone down a street and children playing all make for great shots. Strip it back and hone in on your subject. Simplicity is the key. Focus on the details: a shoe cleaner in Nicaragua. Be quick! To go completely unnoticed, and to get a different perspective, it’s best to keep your camera away from your face while taking a shot. Instead, put it on burst mode (or continuous shooting) and try photographing blindly from the hip by just pointing it towards your subject and taking several photographs in quick succession. Shooting from the hip can be incredibly helpful in teaching you how to observe your surroundings, as well as familiarising you with your camera’s field of vision. Later, when you do decide to lift your camera to your eye, you’ll know exactly what will fit inside your frame and you’ll be faster at composing a photo. If you like to have a little more control many new cameras have a flip-up screen, which can be a great tool for taking photos on the street incognito. A different perspective: bird’s-eye view from a cathedral tower onto the streets of Granada, Nicaragua. Street photography is all about blending in and not being afraid to break the rules, but most of all it is about exploring where you are. Enjoy the walk and soak up the atmosphere of the life around you. Toy with composition to juxtapose people and objects. Capture emotions, contradictions, the tall and the short, the large and the small, the warm and the cold, the light and the dark. Think outside the box and practise, practise, practise! 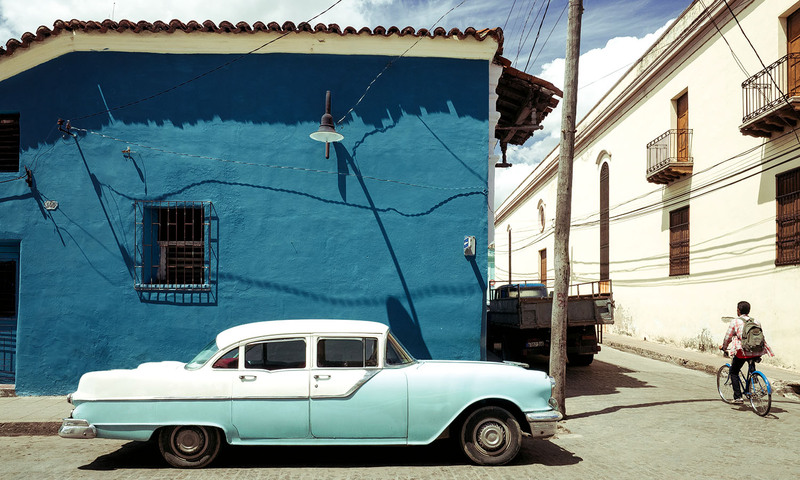 A beautiful composition of blue tones in Camagüey, Cuba.